The Russian Aerospace Forces have destroyed al-Nusra HQ near Aleppo killing at least 67 terrorists, including 19 field commanders. On February 28, the headquarters of the al-Nusra terrorist group near Rasm al-Eis village, 28 kilometers south-west of Aleppo, was destroyed by a KAB-500 guided bomb launched by an Su-24 fighter jet of the Russian Aerospace forces, Lt. Gen. Sergei Rudskoi, the chief of the Russian General Staff Main Operational Directorate, said on Friday. “As a result, 67 terrorists, including 19 field commanders — natives of the North Caucasus and Central Asia, were eliminated. 104 militants were injured,” Rudskoi said. Aleppo was a powerful economic center of Syria before the beginning of the civil war in 2011. It had been under militants’ control for several years and was significantly damaged during the conflict. The city was liberated by the government forces in December 2016. Russian mine disposal units have been clearing the Aleppo from mines since the city was freed from militants 2016. More than 20,000 civilians have returned to the eastern districts of Syria’s Aleppo freed from terrorists after a long siege, Rudskoi said. 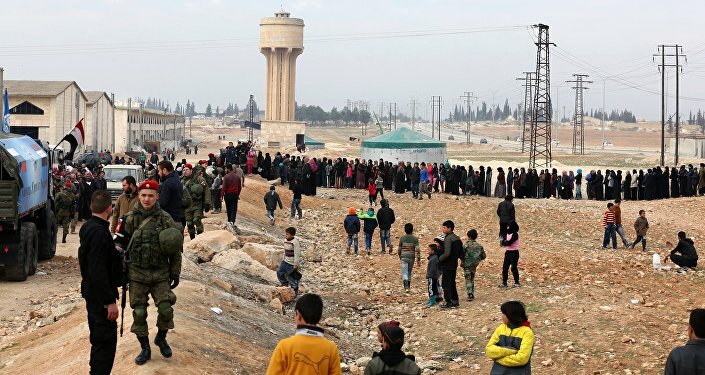 He noted that more than 500,000 residents of the western Aleppo now have the opportunity to work in peace without fear of shelling and terrorist attacks. “Peaceful life has been restored in the eastern neighborhoods of Aleppo, formerly occupied by terrorists. Over 20 thousand civilians have returned to their homes,” he said.